RMT Club tennis training helps build shoulder strength, rotational power, balance, timing, coordination and more. 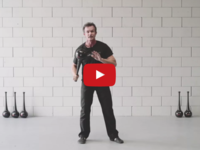 The videos above will show you a series of dynamic movements for improving mobility in the shoulders, hips, and wrists, as well as movements to strengthen the core, lower back, neck and more. 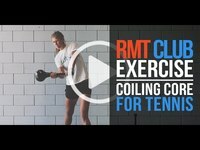 The unique design of the RMT Club allows you to perform dynamic movement patterns in multiple directions essential for proper tennis training. Its weighted head sits at the end of a lever, guiding movement patterns and giving you the ability to increase centrifugal force and speed when progressing through a movement. It also incorporates an internal shifting weight for dynamic resistance and audible feedback which can be used to create and cue fluid movement patterns (no sound) or intense resistance when changing direction (sound).